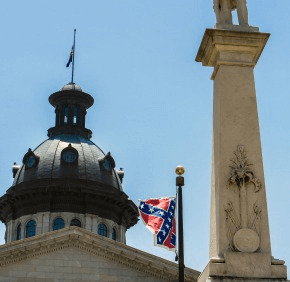 COLUMBIA, S.C. – The Confederate flag will no longer fly on the grounds of the South Carolina Statehouse, and people of faith pray the decision brings an era ofracial healing to the state. Members of the state House of Representatives followed the example of the state Senate and voted to remove the flag in the early morning hours of July 9 after more than 13 hours of emotional debate. Calls to remove the flag, long a point of controversy, reached a fever pitch after the June 17 shooting of nine people at Emanuel African Methodist Episcopal Church in Charleston. Dylann Roof, 21, the alleged gunman, posed for photos with the flag and expressed white supremacist views prior to the shootings. Bishop Robert E. Guglielmone of Charleston said the decision offers a chance for new beginnings. Bishop Guglielmone urged people on both sides of the flag issue to pray and discuss the topic with respect and civility. The flag’s July 10 removal will end more than 50 years on the Statehouse grounds. South Carolina legislators first voted to fly it from the Capitol dome in 1961 to commemorate the centenary of the Civil War, and it remained there for decades. Eventually, the banner was removed from the top of the dome by legislative compromise in 2000, and it was placed on a flagpole on the grounds instead. Many African-Americans and others protested its continued presence as a symbol of racial prejudice, and the NAACP started an economic boycott of the state. Flag supporters, meanwhile, have always maintained that it symbolizes Southern heritage, not hate. Father Jay Scott Newman, pastor of St. Mary Parish in Greenville, called the flag vote “wise, prudent and just,” but urged people not to use its removal as an excuse to forget thestate’s history. Father Dennis B. Willey, pastor of Sacred Heart Church in Charleston, said the flag belongs in a museum. Moving the flag may be the first step on what many see as a long road to equality and justice in South Carolina, said the Rev. Brenda Kneece, president of the South Carolina Christian Action Council. The flag vote was a moment of grace for Sister Roberta Fulton, a Sister of St. Mary of Namur and principal of St. Martin de Porres School in Columbia. Sister Roberta prayed all day while listening to the ongoing debate in the House.